Marinade:3/4 c. oil1/4 c. soy sauce3 Tbsp. honey2 Tbsp. red wine vinegar1 1/2 tsp. garlic powder Whisk together marinade. Add to shrimp. Refrigerate 2 to 3 hours. 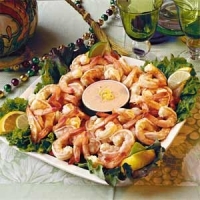 Place on skewers and grill or broil 2 to 5 minutes until shrimp is pink and firm. 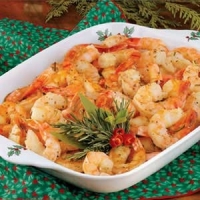 Do not overcook shrimp. Cook chicken slightly longer, 8 to 10 minutes. Serve with rice and veggies.